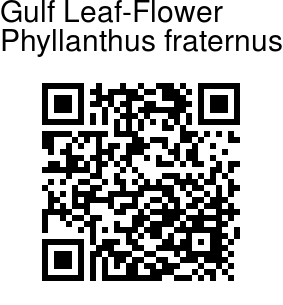 Gulf Leaf-Flower is a slender scruffy to nealy hairless erect annual herb, growing up to 80 cm, usually 30-40 cm, with angular branches. 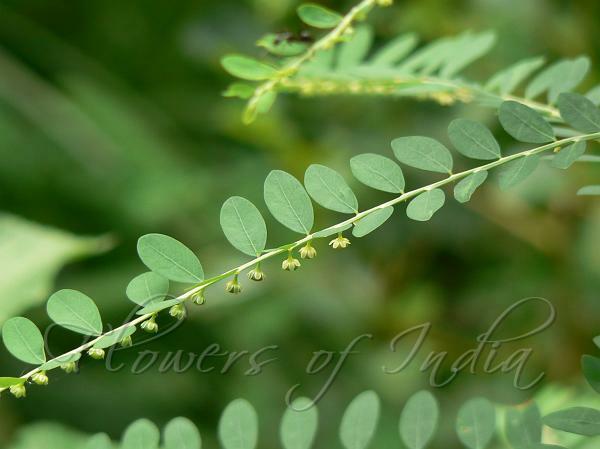 Leaves are carried on 0.5 mm long stalks. They are elliptic-oblong to elliptic- oblanceolate, 5-13 x 1.5-5 mm, blunt or rounded at apex and base, or sometimes tapering to the base. Leaves are dark green above, paler and greyish beneath. Both male and female flowers have 6 tepals. Male flowers have 1 mm long stalks, tepals nearly circular-obovate, 0.5 x 0.5 mm, rounded. Female flowers are carried on 1.5-2 mm long stalks. Tepals are oblong-oblanceolate, somewhat unequal, 1-1.5 x 0.5 mm, rounded, white, midrib green. Disc is thin, flat, irregularly deeply-lobed into 6-10 segments. Fruits are round, trilobate, 1.7-2 mm diameter, smooth. Flowering: August-September.